Every first of November, I have to decide whether I’m going to join in with Clovember again. Clovember (clothes + November) is a tradition in my small corner of the internet, whereby one photographs what one is wearing, every day in November, and blogs about it. If that sounds dull, you’d be surprised at how much there is to say about clothes. There are stories, insecurities, and beliefs. There is wishful thinking, disappointment and elation. And that’s before you even get to the ‘Oh, that dress is lovely, where did you get it?’ type of comments. Clearly finding photography a bit too… convenient, two years ago I decided I’d far rather spend every evening in November in a complete panic, and drew everything I wore, instead, and then decided to add everything my daughter was wearing, too. And that was fun, and the results were colourful and people liked them. But my goodness it was time-consuming. So I didn’t do it last year, and I have decided – a little reluctantly – not to do it this year either, largely because I hope to complete some other drawing projects this month. 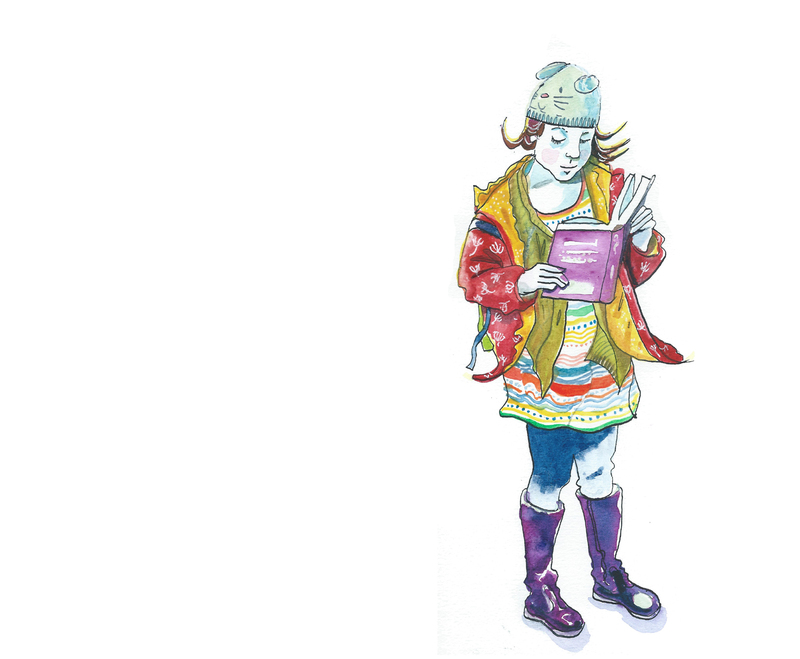 HAVING SAID ALL THAT, well, this morning I looked back at my bookworm of a daughter as she was trudging slowly to school, and I thought, that combination of layers and patterns and colours is kind of irresistible. 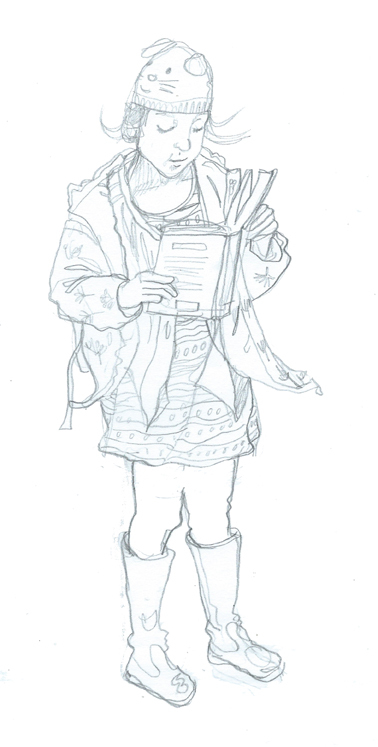 So although I am not, repeat not, doing Clovember 2014, I did allow myself to do just this one drawing.